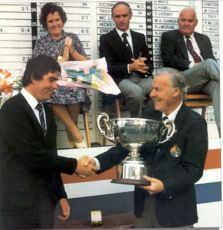 Tom Corridan is another local product and is the only Ballybunion member to win the Irish Amateur Close Championship at nearby Killarney in 1983. He is also a distinguished Irish team player. He was first capped in position in 1991 to help Ireland win the Raymond Trophy in the Home Internationals at Rosses Point Co. Sligo. His early prowess was such that Connacht was the only one of the four provincial boys titles to elude him.